Dagon (2001) opens with our main guy Paul (Ezra Gordon, Band of Brothers) having a aqautic nightmare, in it he is scuba diving and discovers some strange underwater ruin, also encountering a toothy mermaid (Macarena Gómez, Witching and Bitching), startled he wakes up next to his girlfriend Barbara (Raquel Meroño). We come to realize he's on a boat sailing off the coast of Spain along with husband and wife Howard (Brendan Price) and Vicki (Birgit Bofarull). Not long afterward a storm blows in and the boat becomes stranded on some rocks just off the coast of a small island called Imboca. Vicki is seriously injured during the wreck and her husband stays behind with her while Barbara and Paul take a dingy to the nearby island. They arrive at a small fishing village that looks to be abandoned at first, but they eventually find a strange priest at a church, who in turn enlists the help of some fisherman to return to the scuttled boat with Paul and retrieve his friends. However, when they arrives his friends are gone, returning to the island empty handed he finds that his girlfriend is also now missing, and things just get weirder from there. 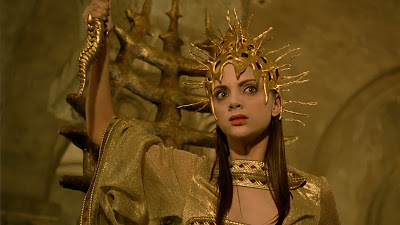 It turns out the island is home to a race of mutated fish-men who worship a deep-sea old god named Dagon, as they rain pours down ceaselessly he makes his way around the island looking for his girlfriend, eventually finding some help from a sympathetic drunkard named Ezequial (Francisco Rabal, Nightmare City), who appears to be the last full-on human left on the island. 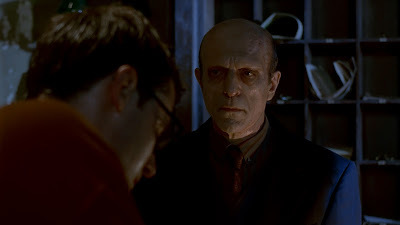 He spins a tale for Paul, explaining how everyone else on the island has been transformed into half-man, half-fish hybrids who worship an ancient undersea god. The special effects of this one are fun, the webbed-fingers and deformed fishy features of the locals are eerie and weird, I like that as they mutate they lose the ability to stand on their own as their bodies morph slowly into tentacled appendages, with many of the locals hobbling around on rudimentary crutches and other wheeled devices. At one point Paul finds what looks to be a tannery full of human skins (including one of the friends from the boat), and he begins to see how truly desperate things are, coming to realize what exactly his recurring mermaid nightmare means, trying to save his girlfriend from becoming a breeding partner for the Lovecraftian water-god while trying not to become another skinned sacrifice for the same dark God. 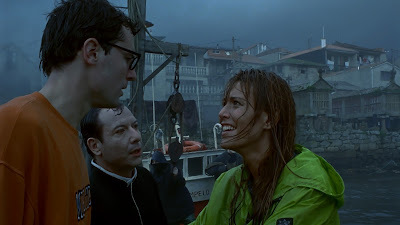 The film is dripping with atmosphere and Lovecraftian intrigue, the ever present downpour of rain and the mysterious fish-men on a strange island makes for a good watch, enhanced by some attractive lensing and an powerful eerie score from Carles Cases (The Nameless). 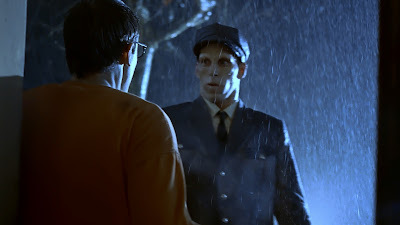 I really liked the main protagonist as played by Ezra Godden, he looks a bit like a younger Jeffrey Combs (Re-Animator) with similar looking cropped hair and spectacles, you get the feeling that the director really wanted Combs in the role, which makes sense, this was supposed to be a follow-up to Re-Animator with Combs starring. Godden balances fright, desperation and humor well, it's not slapstick funny but there's definitely some humor imbued into his performance, he's a bit inept and reluctant hero. 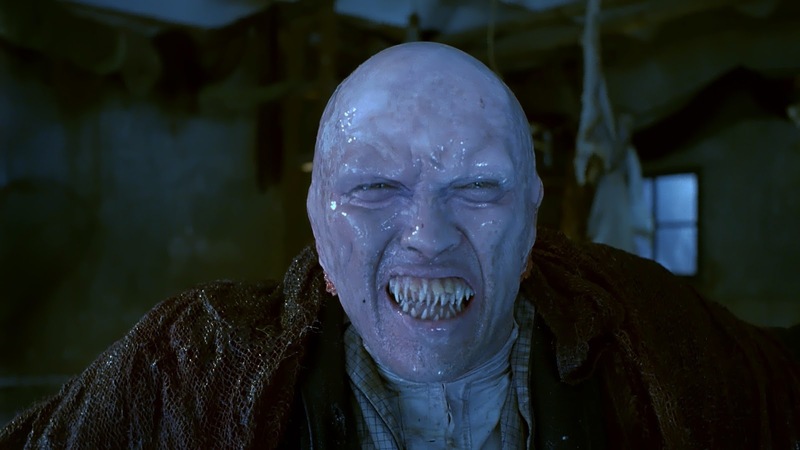 What didn't work for me are the poorly rendered and badly dated digital special effects, these were bad even for Syfy originals of the time. 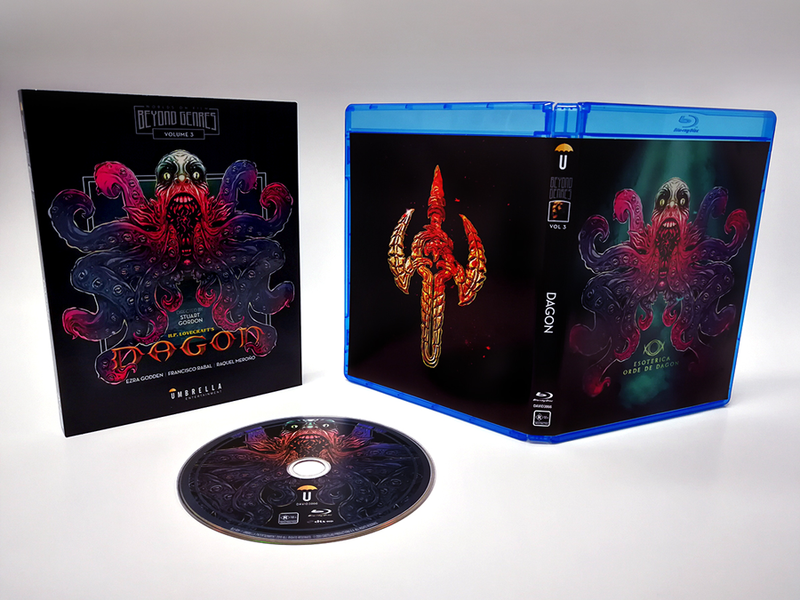 Some of the worst offenders are an underwater shot of the boat early, tentacles emerging from a mouth, and Dagon emerging from the depth, so hopefully your invested in the story and a little forgiving about the shortcomings in the F/X department. The story doesn't have a lot of narrative momentum, once we're on the island there's a lot of general mystery and weirdness, with it becoming a chase film peppered with siege moments, culminating in a show of Lovecraftian other worldliness, there's a surprise revelation that by the time they get around to it has been strongly hinted at for long enough that it's not really a surprise in my opinion, but I still enjoy this one a bunch as an atmosphere heavy Locevcraft adaptation. .
Audio/Video: Dagon (2001) arrives on region-free Blu-ray from Umbrella Entertainment as the third release of their fledgling Worlds On Film Beyond Genres. 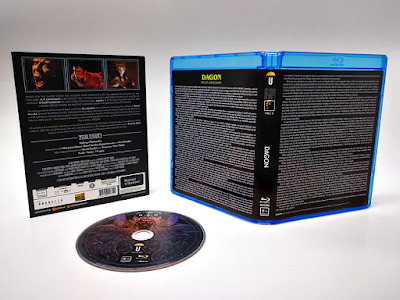 Like the recent Vestron Blu-ray release there's no information about the source of the HD transfer, but it's presented in 1080p HD and framed in 1.78:1 widescreen. The image has some heavy digital noise reduction applied to it, stripping it of grain, leaving skin tones waxy looking. Comparing it to the Vestron release the image is very marginally brighter here, black levels are not as deep though, and both have artifacting and black crush. 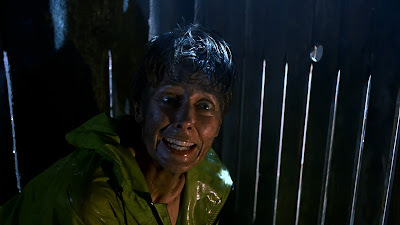 While most of the screencaps are near identical with the same framing it is notable that during the opening nightmare scenes the underwater scenes are much bluer on the Vestron release, I have no idea which is truer to the theatrical release, but I prefer the deeper blues of the Vestron release. 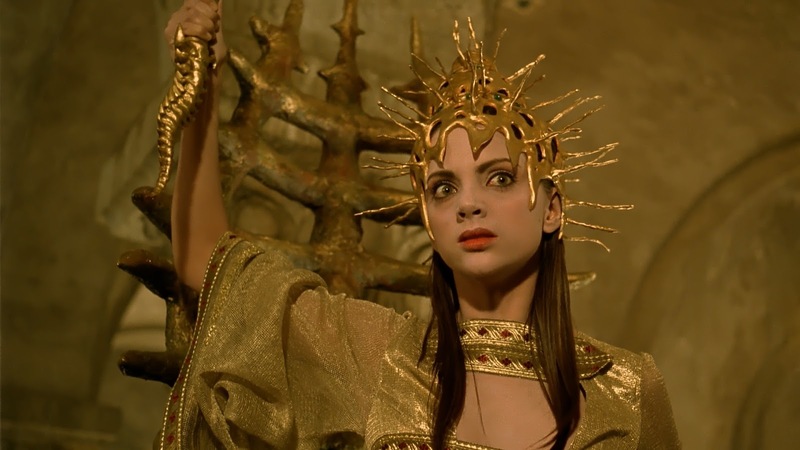 See a screencap comparison of the Vestron and Umbrella Blu-ray releases HERE and a review of the Vestron Blu-ray HERE. The only audio option is an English DTS-HD Master Audio Surround 5.1 mix that has some effective use of the surround channels, especially during the shipwreck scene at the start of the film and with the continual downpour of rain on the island, the score from Carles Cases (Darkness) sounds pretty great in the mix, optional English subtitles are included. Extras come by way of some vintage interview and bahind-the-scenes footage, we get 4 minutes of scenes of the film being shot, scenes from the village and on the boat, plus we get over two hours of interviews with director Stuart Gordon, and stars Macarena Gomez, Stuart Gordon, Raquel Moreno, and Ezra Godden. The disc is finished-up with a teaser, trailer and TV spots for the film. This is the third release from Umbrella's Beyond Genres: World's On Film imprint, the single-disc release comes housed in an over-sized Blu-ray keepcase with a reversible sleeve, the a-side featuring a new and cool-looking illustration, presumably by Umbrella's in-house designer Simon Sherry, the b-side featuring a reprint of the H.P. 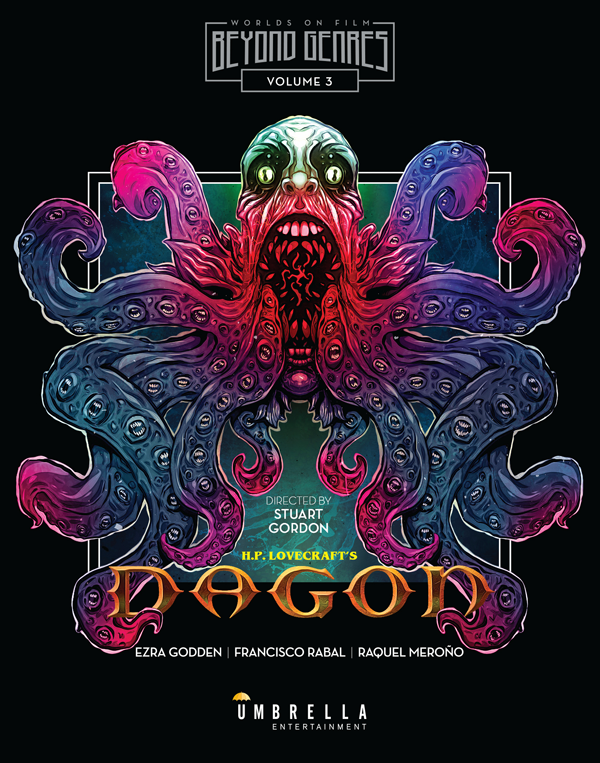 Lovecraft story "Dagon". This release also comes with a handsome slipcase which which is branded with the Beyond Genres logo and movie title, which is absent on the sleeve of artwork, the spine of both the sleeve and slip are numbered, this being volume 3, the disc itself features excerpts of the same artwork. Shortcomings aside Dagon holds-up surprisingly well as a hybrid Lovecraft adaptation, Stuart Gordon is the go-to guy for this sort of thing, so much so that when I think H.P Lovecraft adaptation on film his name is always second on my tongue, and there's a reason for that, he had a real affinity for bringing these to the screen, and even this later entry in his career manages to bring the otherworldly magic. 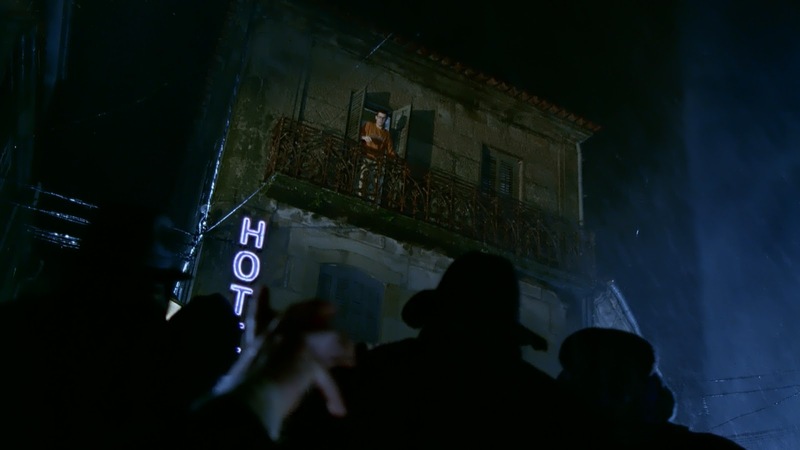 While not all the special effects hold-up the tone, atmosphere and locations are pretty fantastic, it's not perfect but it'll do the job when you're craving a Lovecraftian vibe.